This page on deer stands adds to taking away some of the mystery about our deer hunting lease conditions. It is intended for those new to the Missouri, Kansas or Iowa. The video at right is a quick overview. The information below the same in greater detail. Pictured below is a typical deer stand placement. The stand and trees represent common conditions found on our southern Iowa, all of Missouri and most of far eastern Kansas. Not so much in central or western Kansas. 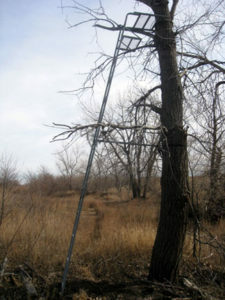 Mid-America Hunting Association allows all types of deer stands. 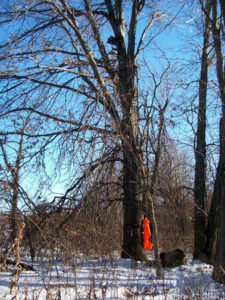 All of what is put in a tree must be taken down by hunters no later than season’s end. Stands are placed at hunter’s risk of loss. Deer stands to include lock-on, climbers and screw in steps are permissible. More than 90% of our deer hunters spend their entire hunting season in stands. The few who walk up or still hunt while having some success do not compare favorably to those hunting from stands. The only value these pictures provide is to remove one more unknown aspect about our deer hunting. Looking closely will show a ladder, then climbing sticks and a lock-on. Deer hunters should bring far more lock-on than climbers. Our tree grow out as much as up rendering climbers useless most times. 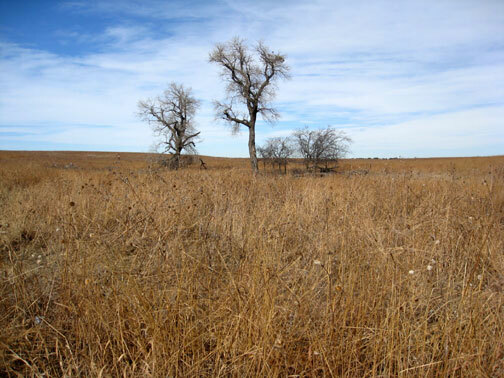 The big open of western Kansas does have in spots tress capable of deer stands for both gun and archery. When it comes to trees for deer stands, Iowa and Missouri will offer choices well in excess of any hunter’s demand leaving hunters only to bring as many deer stands as he can carry. While Iowa and Missouri requires no further discussion of deer stands or tree availability, Kansas is another story. Many good deer spots in Kansas will limit archery hunters and leave rifle hunters with long range shots. 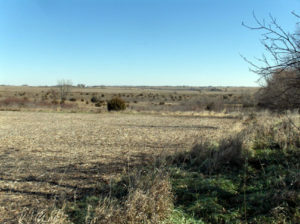 This one lease shown below is such an example of good Kansas deer hunting and limited tree/deer stand opportunity. This deer spot is a 1/4 section, 1/2 mile square of 160 acres of land. The crop fields occupy 50 – 60 acres leaving the rest to wildlife. This wildlife area is further enhanced for our purposes as it has no cattle fence. The wildlife area in the center cannot be seen from road or any farm yard. Surrounding farms are also large grain crop fields without cattle (cattle commonly receive daily attention from a farmer adding human pressure to any land). Walking this lease the first time allowed us to put up 22 deer. That kind of deer concentration is not common. 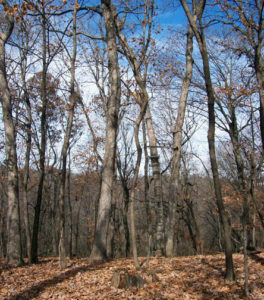 The largest tree on the mid ground left side of the picture is the only tree stand capable tree on this 40 – 50 acre wildlife spot. Some of the deer we were able to get a picture of that were bedded down in grass and brush which ranged from 2 to 15 feet high. And of course, where we put up deer was well away from stand capable trees. The tree suited for stand would allow the rifle hunter good coverage of this large open area. Another case on a different deer lease where the buck sign was strong, the cover thick and the trees available for stand limited. This picture presentation is not to represent all the tree and deer stand conditions to be found in Kansas. The intent of this web page is to prepare first time central mid-west deer hunter of what he may require in terms of versatility. That versatility may also include a ground blind. And, we will assist first year MAHA deer hunters at selecting a region most well suited to his deer hunting preferences. This deer stand section may appear that we are emphasizing negatives in deer hunters will be hard placed to find a tree to put that stand in. That is not our intended result. We do want to illustrate in some areas of trophy deer hunting individual trees for stand may be isolated. Those deer hunters who do well in such country also hunt with decoys, rattling, grunting, doe bleat, attracting scents and most common of all, hunt October when bucks are most influenced to be drawn in for shot. About as open as it gets for some of our Kansas deer country. Those trees would allow a 40 foot high stand for a lock on with wrap around extension. Shooting range is well in excess of 400 yards in all directions. Ground cover in tall grass, 3 – 6 feet high. Deer beds are readily found throughout such fields. And once again we see the limitations contained within one snapshot. This tree and field is isolated from direct observation from any road or farm yard. No adjoining pasture. Neighboring land is in grain. Most would not hunt this spot. The Association staff knows otherwise.